Pumpkins are a popular seasonal item, but they aren’t a big organic mover. They account for just 0.5% of retail pumpkin sales. Experiment with organic pie-sized pumpkins, as those are the pumpkins consumers will eat, to see if they work in your store. For more information on variety characteristics, visit our conventional pumpkins page. 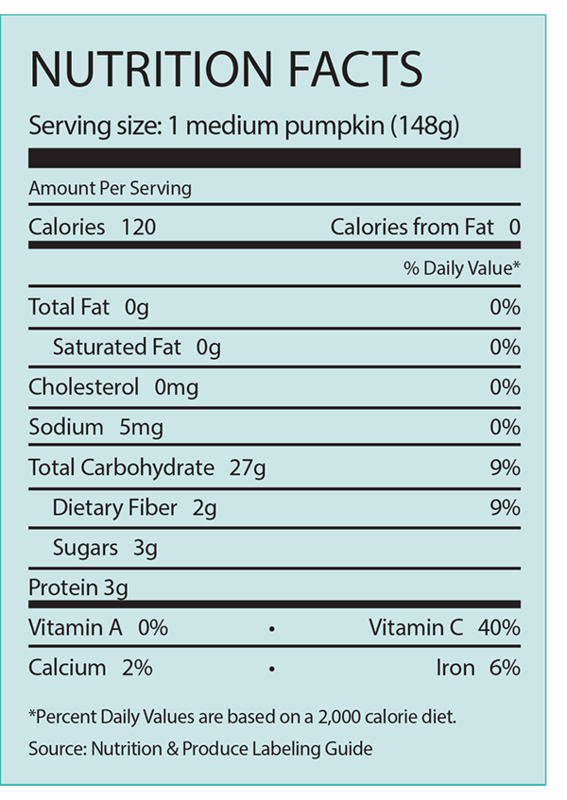 Organic pumpkins will most likely be used in baking, so include them in promotions with organic baking goods. You can also cross-merchandise organic pumpkins with other fall staples like organic apples and apple cider. Promote organic pumpkins from September through Christmas as an environmentally conscious choice for holiday baking. Large jack-o-lantern style organic pumpkins may not be big sellers as consumers are only plan-ning to use them for display. Put your focus on the smaller pie-sized pumpkins when offering an organic option. Include them in a fall display of other organic fruits like pomegranates. Avoid packing pumpkins too tightly as the stems can break off or cause damage to the pump-kins. Consider having organic pumpkins share a display with organic apples as they are both popular during the fall holidays. Organic pumpkins aren’t widely available and shipping options vary. Pumpkins do not store as well as squash. Loss of moisture reduces quality and temperatures about 60 F (15.6 C) make respiration rates too high, resulting in weight loss. Keep pumpkins dry with plenty of air circulation.